If you enjoy the luxurious softness and high-end style of leather, you should consider investing in a leather shirt. Featuring the same leather fabric used to make leather jackets, it’s the perfect alternative to conventional fabrics like cotton and linen. But not all leather shirts are made equal, and it’s important to choose the right type to take advantage of its benefits. Consider the season or seasons in which you plan to your leather shirt. If you’re going to wear it during the summer, you’ll probably a short-sleeved leather shirt to stay cool and comfortable. If you’re going to wear it during the winter, on the other hand, a long-sleeved shirt will offer greater warmth and protection from the elements. Sleeves are an invaluable feature during the winter. They keep your arms warm and comfortable, potentially eliminating the need for a jacket. But during the summer, a long-sleeved leather jacket may prove too hot, which is why you need to consider the season. Think about when you intend to wear your leather shirt, and choose a short-sleeved or long-sleeved leather shirt based on this information. Stay away from shirts made of faux leather. Even if they look like real leather, they lack the attractive qualities and characteristics of the real deal. Faux leather isn’t real leather at all. It’s actually a type of conventional fabric that’s covered in a plastic-like layer. Faux leather shirts are cheaper than genuine leather shirts, but as the saying goes: “You get what you pay for.” A faux leather shirt won’t offer the same level of comfort, style or durability, so spend the extra money by investing in a genuine leather shirt. The quality of your leather shirt will affect its softness, durability, appearance, longevity and more. Because of this, you should inspect them before making a purchase. 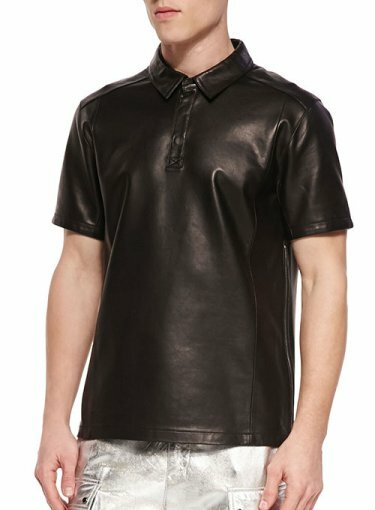 Whether shopping in store or online, look at the overall construction of the leather shirt to determine if it’s well made. Are the buttons properly aligned? Does it have a natural semi-wrinkled texture that’s commonly associated with genuine leather? Are the pockets aligned in the right positions? What about the the collar — does it look crisp and natural? These are all signs of a well-made leather shirt. If you’re don’t see these signs when shopping for a leather shirt, head elsewhere to find this garment. You may have to do a little extra shopping, but nothing compares to the superior quality of a well-made leather shirt. When shopping for a leather shirt, don’t assume that all genuine leather is the same. There are actually several different “grades” of leather, each of which denotes a different quality and production process. Split leather, for example, is a type of low-quality leather in which the top grain is separated from the rest of the hide, whereas full-grain is a type of high-quality leather that contains the entire hide. To fully enjoy your new leather shirt, you need to get the right size. Leather isn’t an elastic fabric that can stretch and deform back to its original shape. It’s a rugged yet soft fabric with little or no elasticity. As a result, leather shirts need to fit your body. If it’s too small, you may struggle to get into it. If it’s too big, it will look baggy and awkward. You can get a leather shirt in the right size, however, by ordering yours from LeatherCult. The color of your new leather shirt will affect the clothes and accessories with which you can wear it. Avoid the temptation of choosing an awkwardly bold color. Instead, choose a traditional color that will match the other garments and accessories in your wardrobe. So, what’s a good color for a leather shirt? Not surprisingly, brown works well. 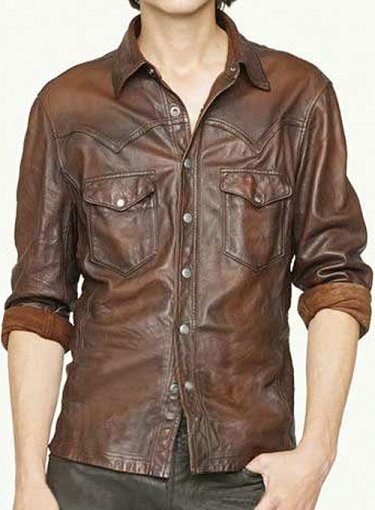 Brown leather shirts offer a neutral, stylish appearance that’s easy to match and looks great no matter how they’re worn. In addition to brown, black leather shirts look great as well. You can even choose a less-popular color like red or white. To find out how much work is required to clean and maintain a leather shirt, check the care label. Typically found inside the collar — right behind your neck when wearing it — the care label should reveal instructions on how to clean and care for the shirt. If it’s made of genuine leather, you’ll probably need to spot clean rather than cleaning it in the washing machine. Don’t worry, spot cleaning is actually easier than using a machine washing. All it takes is the occasional blotting with some leather soap and a damp washcloth. Whether listed on the care label or not, it’s generally best to avoid storing leather shirts in the basement or attic. This may sound harmless, but attics and basements are typically too humid for leather as well as other traditional fabrics. Without any form of air conditioning, airborne moisture is left unchecked. And as the air in a basement or attic becomes more humid, it can saturate a leather shirt, causing it to develop mold. To protect your new leather shirt from mold such as this, don’t store it in your basement or attic. The only exception is if your basement or attic is climate controlled, in which case you can safely store there. You should consider the collar style of a leather shirt before buying it. Some leather shirts are designed with a button-less collar, whereas others have one or more buttons on the collar. Both styles are perfectly fine, but you may prefer one over the other. Of course, the only way you’ll know is by comparing the different collar styles for yourself. After looking at various collar styles, choose a leather shirt in the one that you prefer most.